Will: I couldn’t agree more. I was lost through most of the episode, and I was just barely able to figure out what actually happened in it. I wasn’t as amazed by the visuals as I had been in past episodes, and it really didn’t make a whole lot of sense. The conversation Drew mentioned was a major issue for me, I’m just staring at the screen, trying to get what they’re talking about, and why it’s important. I don’t even know. I feel different about this show every time I see it, and so far, it’s not looking good. Sam: Speaking as the guy who had the most enthusiasm and was the one who really wanted this to be a slaparound title, I am really starting to lose enthusiasm for this show. 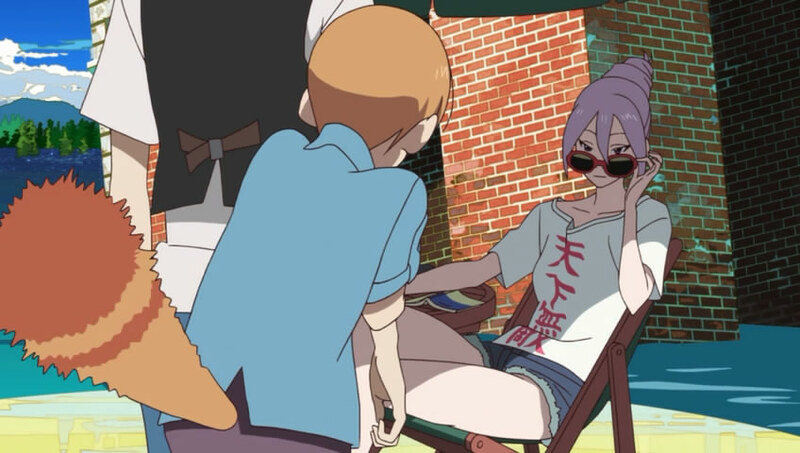 I am looking back on this episode after finishing watching it just 5 minutes ago and here is my summary: Tanuki family does weird sky cruise thing on festival, MC tries to get ship from teacher, teacher gave it to crazy lady, crazy lady says ok. That was 20 minutes of screen time; 1 episode of a 12 episode series. A fetch quest. Drew: And that’s something even Dantalian no Shoka could pull off in half an episode. To be fair, slow pacing isn’t a huge issue for me. A number of manga I really like (hi there, Yokohama Kaidashi Kikou) have slow, deliberate, not-much-happens pacing. What was a bigger issue for me is that it wasn’t really spicing the thinner plot with visuals effectively. It goes back to the one conversation between Tengu, which was just dialogue and people talking. You can’t just write a series about people talking if all they’re going to do is drop terminology. Maybe if there’s drama involved, but a conversation that involved needs the deliberately attention-grabbing visuals of the Monogatari Series or the we’re-walking-and-talking pseudo-action of The West Wing to be worth spending 5 minutes on. That aside, I think there was a bright spot in the episode. 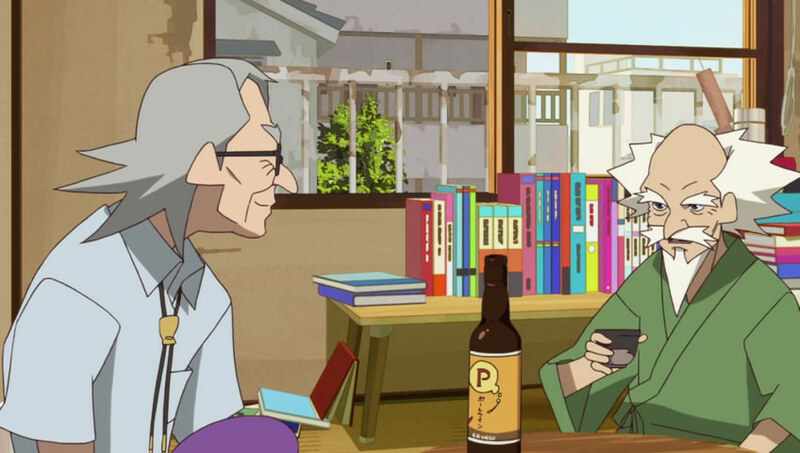 The conversation between Benten, the main character, and the younger brother had fairly good body language and was doing work miles below the surface. The pieces are there, but I feel like this show would benefit from some creative constraint to get them whirring together. Sam: I think the biggest issue with the series so far is that it is clearly based on a novel. The story of novels are meant to be taken as a whole compared to other things like manga or LNs, so stuff like the climax and the resolution don’t really come until later episodes. This episode is the primary issue with adaptations of novels; it’s a linking sequence. It links episode 2 to episode 4 and introduces some things. That is its purpose, and while that works ok in novel form, where it’s supposed to be literally bound to the rest of the work, in TV form it’s frustrating for an episode to end and realize that it meant almost nothing. Do you guys think this is the only symptom of it being based on a novel? Drew: Well, my first inclination is to say no, because Another was a novel and was also handled by PA Works. That show had very effective pacing and each episode was a complete part of the experience. But it might be a different story if we were dealing with a director with no prior experience leading the production of a serial anime. Well, that was depressingly on-base. It’s like the moment I wondered why White Album’s second season was so terrible and then I found out the director of season 2 was different and oh-so-green. To wit, I think the challenge of making singular novels into serial work is very similar to what Sam described. It’s something that can be overcome, like most problems, but it’s definitely a mistake that makes more sense in context of the directing crew’s lack of experience helming serial anime. Will: I just looked that up myself, and came to the same conclusion. Yeah, adapting a novel might be challenging, but this guy just doesn’t have experience. Really though Drew, you just keep saying exactly what I’m thinking tonight. The director just isn’t good enough to handle something like this with a lot of terminology-heavy conversations, and the show continues to suffer for it. Drew: Yeah, it’s very easy to see the narrative here that there’s a playful smooth-animation expert working on a piece requiring body language, which he can do, and wordy conversations, which he can’t. It’s paradoxical, and a downright depressing narrative, but it is what it is. For me, it hasn’t dropped to an unenjoyable level because of that body language, but it needs to be better or it will slip down a deeper well than the one the frog hangs out in. Sam: Every episode I try to like it and every episode I care a little bit less. I’m probably overselling my disappointment, as I will keep watching, but it’s frustrating how this series feels like it could be great yet ends up being dull. The show needs to take the advice of the OP and “Make this dull world more interesting”. This entry was posted in Anime, Dropped and tagged Anime, Another, Body Language, Creative Constraint, Dantalian no Shoka, Fetch Quest, Inexperienced Staff, Monogatari Series, Novel Adapations, PA Works, Slaparound, Summer 2013, Summer 2013 Anime, Tatami Galaxy, The West Wing, TV Versus Movies, Uchoten Kazoku, White Album, Yokohama Kaidashi Kikou by torisunanohokori. Bookmark the permalink.